Over the years I have collected a number of reference books. As my reference shelves expanded, so did my craft. I studied, I wrote, I attended conferences, I met with other writers and exchanged feedback. As time passed, I grew more confident in my pursuits. My writer’s network has grown from local to international and is almost exclusively online, but I still love a good reference. 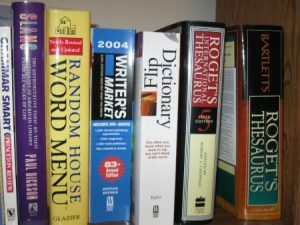 Beyond the typical thesaurus, dictionary and style books are books detailing a period in time, psychology books, historical perspectives on real people and events, atlases, compilations of newsprint and a vintage Sear’s Catalogue. There is no definitive reference. What’s relevant depends on what you write. I write better fiction, because I read truth.